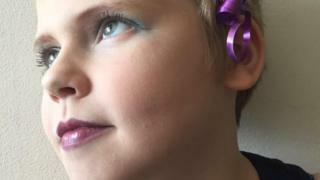 Like many little girls, nine-year-old Autumn Norris loves dressing up and experimenting with make-up. She has identified as a girl for the past two years, after telling her mother she felt she was in the "wrong body". Autumn had just had a bath when she first spoke about these feelings. She wanted two towels, one for the hair and one for the body, "like a woman". "She then came out of the bathroom with her two towels, saying: 'I've got something to tell you Mum, I'm not Anthony, I'm not a boy, I'm a girl'," says Fran Norris. "At the time, I think I was lost for words as for what to say. I just gave her a hug. "I had trouble sleeping that night, I had that many things going on in my head, of what to do from there." Ms Norris, from Shifnal in Shropshire, believes it had been on Autumn's mind for a long time and she had engaged in "feminine role-play" to explore her identity. She would often come to her and ask to wear her clothes, put on make-up, do her nails or wear hair extensions. Initially, Autumn had two weeks, during the Easter break, where she dressed as a girl. "It was taking things one day at a time, letting her lead the way and discover, in herself, who she was," Ms Norris says. "After those two weeks she was going to school as Anthony, and changing and becoming Autumn at home." Eventually, they informed Autumn's school. Ms Norris says it has been "incredibly supportive", and, although the children have had "mixed reactions", teachers have tackled the issue "head on". "They will say things like, 'Do you remember Anthony? Do you remember how upset he could get, and how angry he could be? Don't you think Autumn is happier? ', and explaining Autumn is who she wants to be," Ms Norris says. Ms Norris says they didn't approach their GP until later, when Autumn was referred to the Tavistock and Portman NHS Foundation Trust. The London-based trust sees many UK children who are questioning their gender, through its gender identity development service. It received 2,519 referrals in 2017-18 for under 18s. The majority, 1,806, were assigned female at birth, and there were 13 referrals of children aged five. "Her appointments are just purely her talking through who she is, who she feels that she is inside, how she identifies herself," says Ms Norris. "Tavistock and Portman haven't gone too in-depth with Autumn about future processes and changes. They have talked about the use of hormone blockers, but that's years into Autumn's future if she is still living as a girl." Image caption Autumn's mum says she hopes her daughter can "always express herself"
Autumn says the sessions with the service are something she enjoys. "It is very exciting, because I get to talk about what I am going through and how I am feeling," she says. Ms Norris says she plans to write a book about their "emotional journey", to clear up "misinformation" about the process and how it affects children and their families. "I wanted to get something out there to actually go through the process a bit more in depth and make people aware how it affects a whole family," she explains. Ms Norris has also been in contact with the secondary school she hopes Autumn will attend, which already has a transgender student. She has spoken to that child's mother and says the school has been "very accommodating and has an LGBTQ after-school group". "When she told us this is what she wanted to happen, and wanted to spend some time dressed as a female, at first we saw it as her wanting to experiment. "It was only when she started to do that it became clear that it was the right path for her; whether it remains the right path in future remains to be seen. "If she wasn't given the freedom to choose her identity, it would create problems further down the line. "But nothing is set in stone, because there has not been any physical intervention, no procedures to change her physicality - it is all cosmetic, in the way she dresses and has her hair." She adds: "At this moment in time, Autumn is very settled into living as a female and, when she talks about the future and her dreams, it's about being a mother and getting married to the man of her dreams. "I can't say 100% whether I think Autumn will remain female past puberty; there could be a change when hormones kick in. "But at this moment in time I have a daughter that I'm proud of and will do everything I can to support and help make her wishes come true. "I just hope she will always feel she can express herself." If you have been affected by any of the issues raised, support and advice is available via BBC Action Line.